Official stockist of Eco Tan. Although the Eco Tan story begins with some sadness (the founder's sister had been diagnosed with a melanoma, prompting the birth of the brand!) the good news is that it's one of the most natural, skin-friendly ways to get bronzed. Backed by extensive research and product development, Eco Tan does not use synthetic food colouring, or man-made ingredients, opting instead for chamomile, fruit and flower extracts, herbs and cacao to help people the world over achieve a beautiful, earth- and skin-friendly glow. 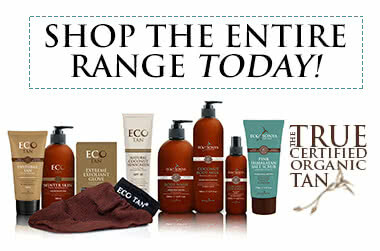 Eco Tan is accredited by the Organic Food Chain, a governing body here in Australia that is also recognised overseas. What does are the OFC benefits? Showing 20 products of 20. Great scrub product that smells amazing and leaves your skin feeling smooth. I found the mitt to be too big, it constantly slips during application and made it difficult to get an even tan compared to other mitts I've used. Such a real shame because the mitt itself feels lovely. I have used the winter skin on and off for years now. I am very very fair, with pink undertones so I’ve found it’s easy for my skin to look muddy, or orange depending on the gradual tanner but this one is the opposite! Just stopped actual fake tanning as I’m in my last trimester and wanted to opt for something easier and less fuss (plus natural). I love this product because it gives my skin a warm neutral glow, cancelling out the red in my complexion after two applications and and if I really want an intense colour it’s just a case of applying daily for a week and I’m left very bronzed. Highly recommend this product and the brand!